Over two years ago, the Elkhart Community Schools had a challenge of how to transition out its two failing 40-year-old pools that were incrementally costing more to repair and operate. The current pools surpassed their natural life span and building new pools was seemingly the only solution. Building two new pools would be $16 million ($8 million per pool) and would have required a bond issuance. The annual operating costs for the pools were $250,000 per year. With the bond and long-term financial considerations, the total investment for new pools required the schools and community tax payers $21 million over 20 years. In its early planning stages, the “Elkhart Health Fitness and Aquatics Center” project team was formulating their strategy. In the midst of their process, a power surge forced the prior local YMCA, then called The Center, to close its doors due to over $50,000 of damage requiring compounded fundraising efforts for its failing building with multiple functional and structural issues. As the only programmed community pool, this closure coupled with the school’s pools challenge, resulted in the reality that the Elkhart community could potentially not have a community pool for aquatics programming and teaching kids how to swim. The scope of the aquatics center planning team’s vision was to create an aquatics center that would be a noted attraction for local and regional amateur swimming competitions. The desire was to create a reason for people to visit Elkhart for competitive swimming and to provide the community a daily resource for swimming, fitness and gathering at the downtown River Walk trail connections. Learning about the school’s pools challenge provided an opportunity to consolidate resources and leverage the costly proposition that community aquatics centers face to operate. Pools are expensive and they learned through other communities that the business model only makes sense if multiple uses and revenues are leveraged to fully utilize pool capacity at all operating hours and days of the week. Successful business models achieve this through partnerships typically involving schools, healthcare and fitness providers and community centers. Discussions with Beacon Health and Fitness were engaged to explore how to leverage pools for daily fitness, aquatics and therapy needs. Together the aquatics planning team and aquatics experts worked with the school’s athletic directors, Beacon Health and Fitness, and The Center’s directors to program all aspects of the potential pool and wellness complex. As a result, the $60 million aquatics center project includes an additional $10 million endowment raised to construct and maintain the pool for the years to come. Instead of the schools investing $18 million in capital expenditures to build new pools, the school contributed $6 million for upfront capital expenditures. Additionally, their 20-year lease agreement is $400,000 per year and this amount will be reviewed and adjusted annually based on actual use. Over 20 years, the school’s total investment is estimated to be $14 million versus $21 million if they built and maintained their own pools. With the school’s contribution, the overall project was able to meet the requirements of 20% public funding to receive an additional $9 million in state funding from the Regional Cities Initiative. The Memorial High School pool has already been repurposed as a band rehearsal space per its current $10 million capital plan. The Central pool will be mothballed and repurposed at a later date. Additionally, plans are in progress for either all third or fifth graders to learn how to swim at the new aquatics center. Years ago, this program was removed from the schools. As a result of this public-private partnership, the schools have saved millions while the private sector orchestrated raising all funds required to provide the community with a state-of-the-art facility that will attract residents, visitors and investors for future economic development growth opportunities in the River District as part of the City of Elkhart’s downtown revitalization efforts. For more information, visit www.elkhartcenter.com, www.elkhartriverdistrict.com and www.elkhart2040.com. ELKHART – Construction of the $59 million Elkhart Health & AquaticsSM is expected to be completed in June, when Beacon Health & Fitness and The Tank will open inside a new complex that anchors the Elkhart River District. The two story, 170,000-square-foot facility, which will be operated by Beacon Health System, will feature a 66 x 25-meter competition pool and diving well named The Tank, Beacon Health & Fitness, and other health, fitness and common spaces. Beacon Health & Fitness will offer cardiovascular equipment, strength training, squash and racquetball courts, fitness studios for yoga, Pilates, TRX training and aerobics, therapy and lap pools, suspended running track, gymnasium and outdoor fitness areas. Similar to the South Bend and Granger locations, this location will bring Elkhart a unique medical fitness model that includes onsite physical therapy, sports medicine and other services. The Tank will be an Olympic-size pool with diving well that contains more than 1 million gallons of water, 3- and 5-meter diving platforms, and movable bulkheads for long or short course events. The natatorium will provide seating for 1,200 spectators. The entire complex has been uniquely designed to not only draw athletes and their families for training and competitions, but also community residents across the region. Children and families will be able to use Elkhart Health & Aquatics for open and recreational swimming, basketball and other sports, as well as community programs and classes. Located on East Jackson Boulevard near the St. Joseph and Elkhart rivers, the complex will generate as many as 100 part-time and several full-time positions. Memberships for Beacon Health & Fitness and The Tank are now available by visiting www.ElkhartHealthAndAquatics.org or by stopping by the trailer in front of Elkhart Health & Aquatics. Call 574.389.5580 for more information. The project is a collaboration of Beacon Health System, Elkhart Community Schools and the Community Foundation of Elkhart County, with additional contributions from the City of Elkhart, the Regional Cities Initiative and the generosity of the local community. ELKHART, Ind. – Indiana Michigan Power, on behalf of the AEP Foundation, is donating $300,000 to support the Community Foundation of Elkhart County and Beacon Health System’s project to build a premiere health, fitness, aquatics and community center at the former YMCA in Elkhart. The grant money will specifically go to the development of the 6,000 square-foot community center, which will include a public atrium, meeting spaces, gymnasium, library and an outdoor patio overlooking the river. The approximately 170,000 building will be home to Beacon Health and Fitness, the Elkhart Community Schools swimming and aquatic programs, Elkhart United Aquatics, Bethel College and other local and regional swim competitions. The plan is to host future amateur championships in swimming and regional and state high school competitions. Families and young children will be able to use the facility for recreational swimming and sports like basketball and volleyball. The Health, Aquatics and Community Center is expected to be open to the public in June 2019. 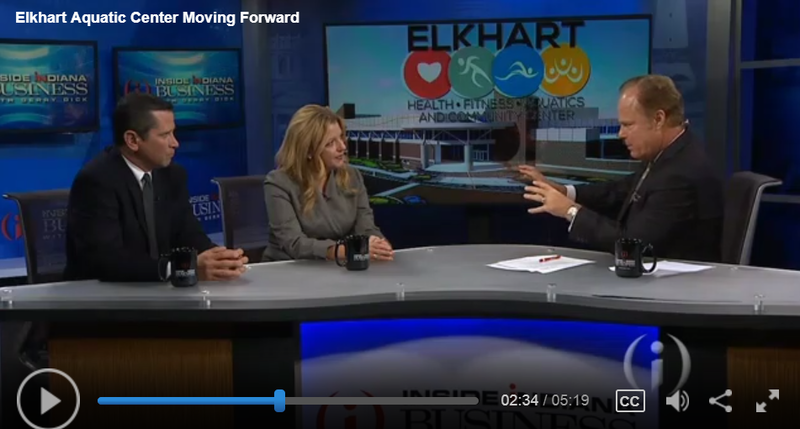 Elkhart Health Fitness and Aquatics (EHFA) is based in Elkhart, and its leadership consists of a partnership between The Community Foundation of Elkhart County and Beacon Health System to own and operate The Elkhart Health and Aquatics Center. This 170,000 square-foot facility includes one of the largest aquatics facility in the country, along with a Beacon Health and Fitness Center and central community gathering space serving Elkhart and its surrounding communities. Visit www.elkhartcenter.com. The AEP Foundation is funded by American Electric Power and its utility operating units, including Indiana Michigan Power. The Foundation focuses on improving lives through education from early childhood through higher education in the areas of science, technology, engineering, math and the environment and by meeting basic needs for emergency shelter, affordable housing and the elimination of hunger. Indiana Michigan Power (I&M) is headquartered in Fort Wayne, and its 2,450 employees serve more than 593,900 customers. More than half of its generation is emission-free, including 2,278 MW of nuclear generation in Michigan, 450 MW of purchased wind generation from Indiana, 22 MW of hydro generation in both states and approximately 15 MW of large-scale solar generation in both states. The company’s generation portfolio also includes 2,600 MW of coal-fueled generation in Indiana. Athletic Director Tom Visker is pleased to announce that Bethel College will offer men's and women's swimming and diving as varsity programs for the 2018-19 academic year. The addition of swimming & diving, as well as bowling announced earlier this summer, will bring Bethel to a total of 23 varsity programs competing in the National Association of Intercollegiate Athletics (NAIA), and 29 intercollegiate teams total. The Pilots most recently added competitive cheer during the 2016-17 academic year. "Northern Indiana and the surrounding states have many great swimming and diving programs in the high school and club circuit. We are excited to be one of only a few small colleges offering swimming and diving programs in this region," noted Visker. "I'm confident we can build a competitive program while providing many more student-athletes a quality, faith-based education." The Pilots will join Indiana Wesleyan as the only Crossroads League schools to offer the NAIA championship-sponsored sport. The swimming & diving program will make their home venue the brand-new Elkhart Health, Fitness, Aquatics, and Community Center in Elkhart and will begin recruiting and filling the roster immediately before officially competing in 2019-20. Student-athletes interested in competing in men's and women's swimming & diving at Bethel can complete and submit a prospective student-athlete questionnaire. Additionally, Visker has tabbed Deb Thompson as the first head coach in men's and women's swimming & diving program history at Bethel. Thompson comes to the Pilots with 27 years of combined experience coaching swimming & diving, including 16 years at the collegiate level with stops at Oberlin (Ohio), Washington & Lee (Va.), Drexel (Pa.), SUNY Geneseo (N.Y.), and UW Whitewater (Wis.). Thompson's team won 11 conference titles at SUNY Geneseo. She coached a total of 50 All-Americans and was named a Coach of the Year six times. For the past 11 years, Thompson has held the position of the Physical Education and Health Teacher at St. Joseph High School in South Bend, where she was also the Department Chair. Thompson has also served as an Adjunct Professor in the Kinesiology Department at Bethel since 2011. Read the full release at BethelCollegePilots.com. Completed masonry on east, west, and north exterior walls and completed underground plumbing and electrical of teaching/fitness and therapy pools. Began pool piping and concrete for whirlpool. The value engineering efforts continue to find $1MM in project savings. We will be locking in masonry and those vendors who are in immediate need to keep moving forward. Physical therapy and sports medicine functions will be the medical fitness space focus. Beacon is covering the design costs. Curbs are in for the parking lot. Prep for asphalt is underway. Steel is scheduled to start on Wednesday 10/25/17. Main structural steel will take 2-3 months for topping off. Naming committee for the facility is moving forward with survey. Regional Cities documentation is sent for the first appropriation. Rotary and service organization events are underway at the Lerner Theater. In the overall fundraising effort, $1.4MM remains to be raised of the $69.5MM. Crews will soon dive in and break ground on a $65 million fitness and aquatics center in Elkhart. Shelley Moore and Pete McCown, who are close to the project, outline the economic and local community benefits. 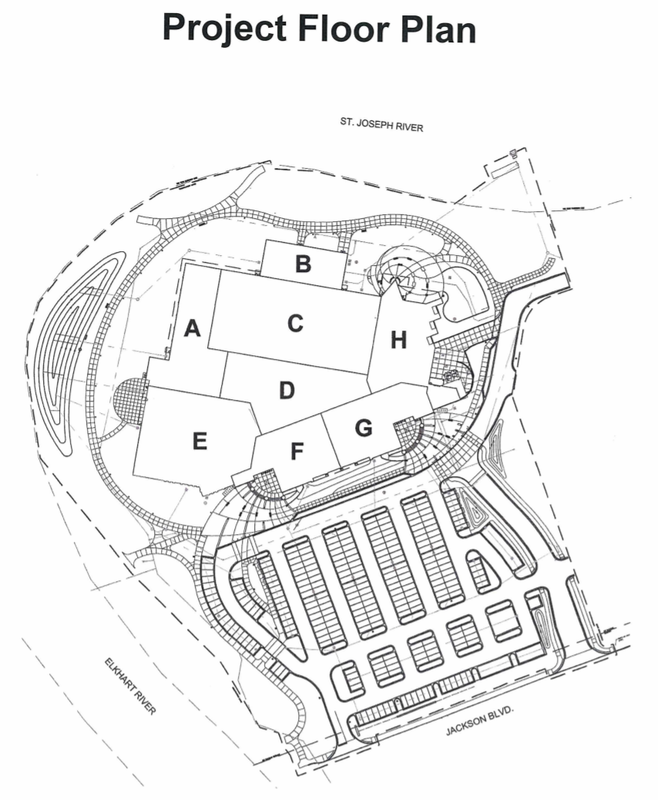 Skillman and the design team are working to keep construction documents on schedule. Site groundwork is repacked for foundations. The steel package is released and scheduled for production. Targeting for the steel package to arrive later in September with utilities and infrastructure development. Layout of storm water is complete. Phase 2 bid package is under final value engineering for adjustments needed to eliminate overages. Communications plan for events, announcements and membership presales are complete. Facility Naming Team has developed list of potential names to be vetted in panel market research which will be open to the community for additional feedback. Elkhart Rotary will be the ambassadors for the phase 3 public fundraising efforts. Events will occur in September and October along with other service organization. The targeted amount to be raised is at least $250,000, which will be match by Kem Krest Corporation. Rotary events inviting the public to learn about the project will take place on the following dates and times. RSVP is required. Groundbreaking ceremony and event for lead donors will be scheduled for late September and early October. Target facility opening is February 2019. Pool bids will be submitted next week and steel package is projected to go to bid this week. Variance approvals are expected for this week on construction pieces for the bid. Final property acquisitions are soon expected to be under contract, including the Moringa Tree and the Mexican Market. Expected project overruns have been realized and there are some design changes will be taking place - overruns will be covered by the contingency. The design budget is still being refined. A first LLC board meeting (Community Foundation of Elkhart County and Beacon) will be taking place within next couple of weeks. Need to secure $3-4 in fundraising. Building zoning / placement variances will need to be submitted with the City the third week of April for approval the second week of May. ELKHART - Five entities came together today to confirm their commitment to the collaboration in support of the Community Foundation of Elkhart County and Beacon Health System’s effort to build a state-of-the-art medical fitness, aquatics and community complex at the former Elkhart EYCC/YMCA location. According to Tom Housand, project visionary and prior EYCC/YMCA board chair, the estimated $55 million facility will be a community, medical fitness and aquatics facility that will be home to Beacon Health and Fitness, the Elkhart Community Schools swimming and aquatic programs, Elkhart United Aquatics, and various local and regional swim competitions. Plans call for an early 2019 opening and officials say they plan to attract and host future amateur championships in swimming, as well as regional and state high school competitions. “The complex will be a ‘game changer’ in terms of offering area athletes a training and competition-level swimming and diving facility. It will be one of four in the country with the capabilities to facilitate the combination of aquatics, medical fitness and community engagement,” said Pete McCown, President of the Community Foundation of Elkhart County. The complex will be approximately 170,000 square-foot building with a 66-meter by 25-meter competition swimming pool. There will be an attached diving well with 5-meter and 3-meter platforms and multiple 1-meter boards. The natatorium will seat 1,200 spectators. There will also be a 25-yard fitness pool, a therapeutic pool, wet classroom, dry training space, member, public and student locker rooms, an additional gymnasium, a large community atrium, outdoor patio with access to walking trails, and multi-purpose rooms for meetings and special occasions. In addition to regional and high school competitions, young children and families will be able to use the facility for open and recreational swimming and sports such as basketball, pickleball, volleyball and other community programmed classes. Programs will range from an array of swimming and youth sports programs and adult programs. Special Olympics events can also be held at the community pool, McCown added, along with multiple spaces for other not-for-profit and community programs. Organizers confirm that the total funding for the “Elkhart Heath, Fitness, Aquatics and Community Center” (official name to be determined) is slated to be $65 million and will primarily be provided by the Elkhart philanthropic community, the Community Foundation of Elkhart County, Beacon Health System, Regional Cities Initiative, Elkhart Community Schools and the City of Elkhart. Regional Cities funds of nine million dollars have been awarded. Operational funding will be achieved via memberships, rental agreements, and other community and outside groups that will utilize these facilities. An important addition to the partnership is the recent announcement of the City of Elkhart pursuing the contribution of two million dollars toward the south parking lot which will provide nearly half of the required parking for the facility. The first commercial building is down. The east side and back of EYCC building is down. Still working on completing bid estimates and they are underbudget. They are going to bid soon and project knowing the bid outcomes the second week of March. The bid estimates did not touch any contingencies. Project is tracking well until we get the market to respond. These structural bids will be the largest number. Decided to set a decision threshold for anything over $100,000 to be presented to core team. Demolitions will occur through March. Bidding will be a three-week duration. Mobilization will start by end of March for foundations – there is a lot of earth to be moved. Late summer we project to have construction out of the ground. In March there is hopes of completing the appropriation to the City Council for approval of a grant for $2MM. Umbaugh is completing the City bond analysis for the River District project to determine best funding to complete all projects with no tax impact to the community. Best options will be presented to City Council. Formal press ceonference will be in February.